This page has a useful table to help you choose the version that’s right for you. System Requirements: Mac OS X 10.6 (Snow Leopard) and above; Intel processor with at least 1GB RAM; 1024 x 768 or higher screen resolution. DVD player for boxed product. FileMaker Pro is the most venerable, probably the most used, and certainly the best established relational database management system for the Mac (Windows versions are available). Earlier reviews on MyMac (towards the foot of this page (version 10) and here (11) have been very favorable. You are referred to these reviews for an overview of the product and the FileMaker product line. Not for nothing have sales of members of the FileMaker Pro family (which is localized in 15 languages) increased steadily in volume: FMP 11 alone has sold upwards of 18 million units since its introduction; this version (FMP 12) recorded over 100,000 units downloaded in the first week since its launch a couple of weeks ago. Databases can be off-putting: dauntingly heavy on… data; by definition they’re intense about numbers and text, formulae and calculations; data is usually presented in a grid, apparently inflexibly. For less experienced and/or older users who might simply want to store and retrieve data relating to their hobby or family, say, “database” suggests the flashing green-screen command line terminals of the 1970s and ’80s. The designers and engineers at FileMaker Pro have become more and more concerned about the aesthetics of displaying data. Indeed, the slimmer Bento has a beautiful interface that makes using it as pleasurable from that point of view as is using almost any other kind of software that emphasizes layout on the screen. 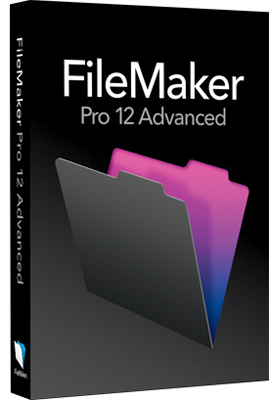 FileMaker Pro 12 goes much further than previous versions. And not merely by sprucing up and making slicker the user interface. It brings no fewer than 40 new layout themes which can be applied instantly and retrospectively to your data using a really easy to use Theme Picker (Layouts > Change Theme…) Colors are carefully-chosen, balanced and appealing. Physical use of space (between, perhaps, otherwise crowded fields) is intelligent and guides the eye. Fonts and object styling complement the presentation of data without spurious effects for their own sake. Gradient fills, image fills (including scaling and slicing), transparency and rounded corners. Very nice. This version of FileMaker Pro 12 also includes standards-compliant assistive technology such as labels with an Accessibility Inspector. Perhaps most significant of all is that these are so well, so professionally, designed as templates that you can adjust them as little or conversely as far away from each starting point (infinitely multiple undo is supported) as you want. So you learn how to present data as effectively as possible without having to study design in depth. Professional is indeed the keyword. Newly-designed and improved rulers, grids and guides to get exactly the right spacing and proportions – leading the eye to the results implied by the data. In a way this new approach is the best of both worlds: quick and streamlined-looking pages for those whose specialty is not design. Huge degrees of flexibility are just as available for those who delight in perfecting every last customizable aspect of appearance. Included in the new tools for enhancing the design of your data presentation are gradients and borders – and visual feedback on objects’ states… hover, pressed, in focus. In fact the web’s CSS (Cascading Style Sheets) technology has come to mainstream database design. Layouts and designs have been built and optimized with the smaller screens of iOS in mind too. Indeed, FileMaker Pro 12 ships with inclusive iPad and iPhone themes that envisage the different criteria for using fonts, colors, buttons, and other objects on iPad and iPhone. The new concept of “stencils” provides instant feedback on the suitability of a layout to a device. In the past, there’s not been much of an incentive really to delve into this aspect of FileMaker‘s aesthetics. Now, so varied and attractive are the themes as supplied that it will surely not be long before almost all users of the product are showing off the results in such environments as business, educational, libraries, advocacy groups and non-profits, commercial, art and creative spheres – and maybe even in government and similar bureaucracies, a sector that has many FMP users. Indeed, during evaluation for this review, playing with (sorry, “progressively and carefully iterating through”) the many attractive themes that ship with the product soon became a pleasant way of bringing new life to old databases. It’s been extremely well-implemented if by “well” is meant an almost perfect balance of time expended and impressive results. In a connected and somewhat similar vein are Starter Solutions. FileMaker Pro 12 now has 16 of these – professionally designed (and obviously exhaustively-tested) templates that get you going quickly… schedulers, for project management, invoicing, estimating and inventory tracking, time billing and the like (there’s an understandable bias towards business) – also personal data, contact management, assets and tasks. Note that these can be easily modified if your precise circumstances differ. But, again, a useful learning resource. Again, during testing these were found to work very well indeed. Significantly, the Starter Solutions also include layouts customized for iPad and iPhone. By now it should be clear that this new version of FMP isn’t so much about massive new ways to crunch numbers and achieve results. But it’s made significant strides in how it presents the data. Indeed, so major are the changes that the now familiar .fp7 file extension (last changed, obviously, with the introduction of FileMaker Pro 7) has given way to .fmp12 (“fp12” was taken). Once again, during testing the conversion process necessary for every file built under FMP 11 and earlier worked flawlessly. Aligned to better and more sophisticated display of purely alphanumerical data come two notable improvements in the way FileMaker Pro 12 handles charts. In the first place “Quick Charts” acts on data that you’ve previously sorted and grouped. New is the set-up with tools like a conventional “Inspector” window. Changes are visible as you work, which encourages experimentation until you get exactly the look and feel that you want; Charts can be saved as Layouts and an inbuilt menu system reflects decisions you make as you work in the data… selection and order of fields, for instance. Then there are five completely new types of chart: bubble, scatter graph, positive/negative, stacked bar, and stacked columns. That’s twice as many as previously. Producing these during testing was just as easy as claimed. Container fields were introduced and extended in earlier FileMaker versions to allow the storage of data other than alphanumerical in the corresponding filetypes… chiefly visual (photos, videos), audio (music, speech) and other (self-standing) documents; these now extend to fully searchable rendering of PDFs in situ – including copying text. 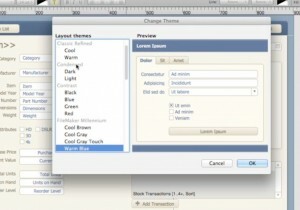 FileMaker considers these changes to the layout and they are effected in Layout mode by checking an “interactive” button. 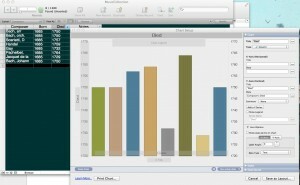 FileMaker Pro 12 reflects a substantial re-engineering of container fields which claims to improve database performance. There was a noticeable speed-up – as would be expected – when images, videos and music was accessed from within the database thanks to the product’s newly introduced thumbnail caching routines. Certainly, dragging and dropping worked perfectly. Significantly, when data is stored externally, it and its backups can be encrypted with AES-128 – ensuring greater security. Such data which until now has been embedded inside earlier versions of FileMaker can now be converted for remote storage. Some functionality of FileMaker Pro has always been enhanced by third-party plug-ins. New scripting and Container logic in FMP 12 makes installation and management of these plug-ins much easier. It’s now possible to create database systems specifically customized for FileMaker Go for iPad and iPhone (which is now a free App downloadable from Apple’s App Store) using scripts and calculation methods that determine what will work on iOS devices, and what wouldn’t. This version (12) of FileMaker Pro comes with a set of themes that optimize fonts, colors, buttons, and other objects on mobile devices. The aforementioned screen stencils guide you whenever you want to build layouts specific to the iPad and iPhone. Although not tested exhaustively for this review, it’s plain that a lot of thought has gone into making use of FileMaker in a mobile context both flexible and sophisticated yet easy to achieve. The new location-based function using iOS devices’ GPS sub-system, for instance, could work in database applications to track inventory, deliveries, and the like. 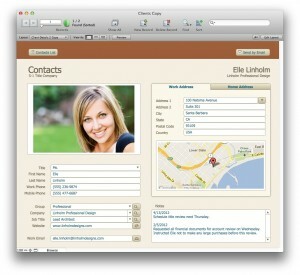 The FileMaker website <http://www.filemaker.com/products/filemaker-go/tasks.html> has many such sample projects. Options to activate all the new functionality mentioned here give the user greater control. The intelligent menu hierarchy that has always supported FileMaker Pro use is retained and makes sure that the most needed items are the most accessible but that the others are rarely obscured. Lastly, FileMaker Pro Server has been rebuilt with 64-bit architecture, making for faster WAN and web performance. All in all, this version (12) represents a significant step forward in several ways: enhancing the way data is presented and making the process of doing so easier and more flexible than ever before. Greater efficiency and sophistication with Container fields and Charts. And tighter, more fluid, integration with iOS mobile usage. If you’re a FileMaker Pro user, you’ll want to upgrade without a second thought. If you’re looking for a state of the art product that will do 99% of most regular data-intensive tasks, this updated and improved version (12) remains the reference product of its kind. Pros: Although enhanced data crunching doesn’t figure prominently in this release, the huge improvements to presentation make it an attractive upgrade well worth investing in. Cons: It remains an expensive product (line); but well worth the outlay. 99 nerves? Not with the G-Men!